The Buchi R210 Rotavapor uses a B-491 4L insulated heating bath, with a digital temperature display, that’s PTFE coated, can use oil or water, and has a temperature range from 20 to 180° C (68-356°F). The Buchi R210 Rotovap has a space saving modular design that allows you to add integrated vacuum controllers and processes sample sizes from 50 mL to 3 L, in plastic+glass coated glassware. The Rotorvapor has a digital vapor display, and run present time/pressure gradients. Users can lift and lower glassware on the rotary evaporator effortlessly with the quick-action motorized servo jack at the touch of a button. The jack on this Buchi Evaporator can be lifted manually in the event of a power failure. This listing is for a used Buchi Rotavap model R-210. 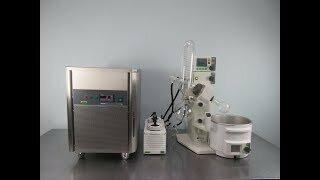 The rotary evaporator has been tested to ensure pump is reading properly and pressure tested. Water bath tested to maxium temperature, RPM's on the driver, as well as raising and lowering operations all performed as expected. System maintains constant temperature at desired set points. The Vacuum Evaporator is ready to ship within 3 business days.